It’s that time of the year again: predictions time. In the media world, the more extreme, scary, and shocking you can make them, the more attention that can be generated with your predictions — hence, the better the predictions are. They have nothing to do with reality. In the days ahead, you will hear and read calls for outright booms, calamitous depressions, and everything in between. And quite conveniently, they’re all going to happen within the next calendar year. My colleague Ian Cooper jumped in on the act yesterday with a few 2012 predictions of his own. But Ian was using them more as an exercise of the potential risks ahead: what to be prepared for and how to get ready to trade the full spectrum of possibilities. He wasn’t claiming to be an all-knowing prognosticator. Today I give you five charts showing some emerging trends that will have a big impact on the New Year — and beyond. While Wall Street hangs on every quarterly GDP report, monthly jobs number, and weekly jobless claims tally (all of which get revised significantly later on anyways), there are much bigger trends that reveal a lot more about the economy and the markets. One of the most important is disposable income. If 70% of the economy is consumer spending, you can bet how much money consumers have to spend is extremely important. 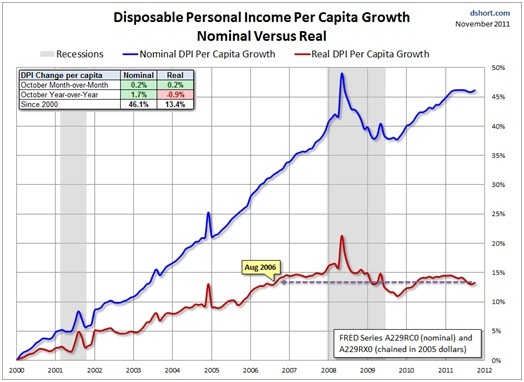 Real disposable personal is at the same level it was five years ago. Consumers’ ability to shop has been essentially unchanged for five years. Consumers who have worked for six years naturally expect their disposable income to rise. They expect to be able to upgrade cars, vacations, houses, and still have more left over to save and invest after years of advancement and achievement. Flatlining real disposable income doesn’t allow for any of that. And it’s one of the major reasons most people don’t feel any better off than they were five years ago: on average, they aren’t. Join Wealth Daily today for FREE. We'll keep you on top of all the hottest investment ideas before they hit Wall Street. 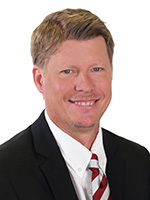 Become a member today, and get our latest free report: "Silver Outlook for 2019"
Keeping the focus on consumers, there is some good news for them in real estate. While housing’s collapse has been at the center of the ongoing recession, there are many benefits from the drop in real estate prices. The biggest is freeing up more money to be spent elsewhere. This is a great thing for the economy as a whole. The house-as-an-ATM lifestyle may be over for good. However, mortgage payments now taking up half the level of consumers’ income as they did in 2005 is a strong growth factor in every other sector of the economy. It’s not just housing prices: Consumers could be getting even more of their income freed up in 2012 as another costly bubble show signs of deflating. Grocery bills could be headed for a sharp drop in 2012 as well. Last week we noted how a farm in Iowa recently sold for $20,000 an acre — more than 10 times the average price for Iowa farmland a decade ago. The extreme high for farmland is an indicator that the agriculture sector may have run up too far, too fast once again. The 10% correction in food and agriculture prices is likely going to put even more money back into consumers’ pockets. The Bureau of Labor Statistics estimates the average consumer has spent more than $6,000 a year on food since 2008. That money is going to help pick up a lot of the slack in non-agriculture sectors. All of this is already starting to show up in consumer consumption activity. I’m not talking about GDP numbers, which are artificially inflated because of manipulated inflation numbers and other factors. I’m talking about consumption of real stuff. 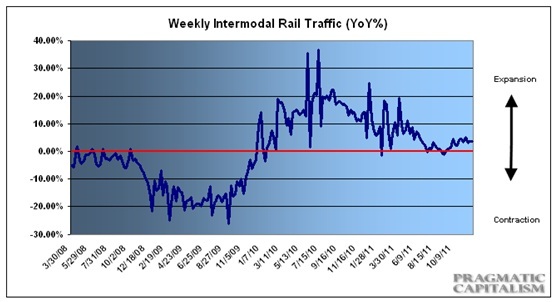 The best way to track real consumption activity is through rail traffic. It measures the number of rail cars and physical volume of stuff transported from producers to consumers. In other words, it’s a great indicator of the real economy and real wealth creation. Although the growth rates are nothing like the post-credit crisis rebound, they are still positive. That shows consumption of more stuff is still on the rise. Better yet, as more disposable income rises, rail traffic will increase even more. Finally, there is one trend that has been alarmingly consistent over the past two centuries. It’s driven by basic human nature — that is, to get wealthier and improve one’s living conditions. 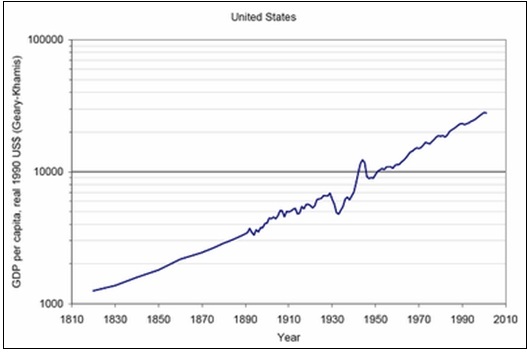 Even the Great Depression was nothing more than a minor blip on the long-run growth, innovation, and productivity of a free people. This is one trend not to bet against next year — or over the long-run, either. The bubbly boom times may be a long ways away, but the near-term trends affecting disposable income are laying the foundation for an improved recovery and more growth. Any further corrections next year (because there will be corrections) should be seen as an opportunity rather than another cause for exiting the markets altogether. One good number will launch the price of oil overnight. When I recently discovered that some of the wealthiest and most successful resource investors in North America were putting their own money into this project, I hopped on a plane with Nick Hodge and Andrew Mickey to see it firsthand. As the Yukon territory moves into spring, and certain properties become more active with drill-testing and production, more and more attention will be centered on two Shawn Ryan centerpieces... And we'll give you all the pertinent details on Wednesday evening at 6 o'clock. Join us for this groundbreaking event.